When your furry friends are fighting, constantly chasing each other, or hissing the whole time you don’t need to be Sherlock Holmes to know something is up. But tension can be harder to spot. It might just be that your cats avoid body contact or even eye contact, or that one puss blocks the other from certain parts of the home. 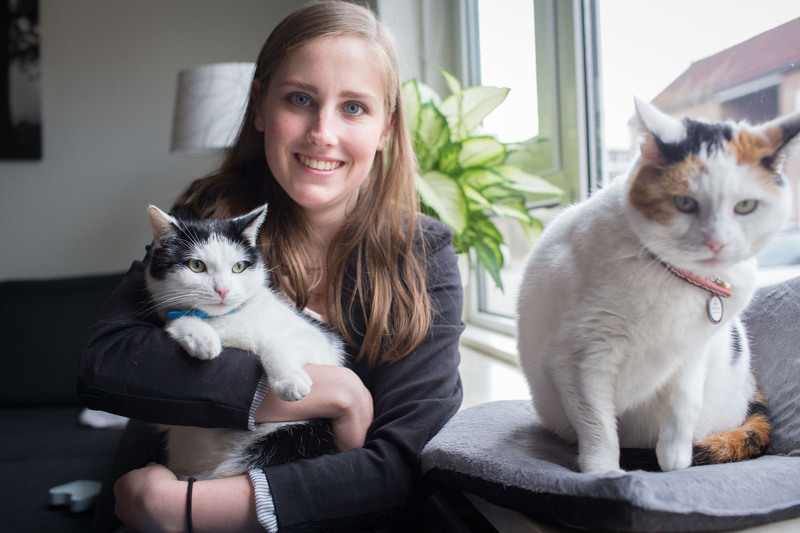 We spoke to our four-pawed expert Dr. Alexandra Beck to find out exactly what to look for and what to do if there is tension between your furballs. Is there tension between my feline friends? If you’re concerned, ask yourself these questions: do you see your cats sleeping close to each other? Do you see them grooming each other or mutually rubbing their heads on each other like they do on your legs? If not, then there could be something wrong. Other possible signs that your felines may not be BFFs includes loss of appetite, one puss hiding most of the time, excessive grooming, spraying urine on the walls and going to the loo outside of the litter box. Conflict should also be distinguished from play fighting. If interactions are mostly one way, there is a lot of wrestling with vocalisations, and there is biting and claws involved then sadly your kitties are not playing! Why aren’t my cats BFFs? Cats, like people, have different personalities and when personalities clash it can sometimes lead to furry fights. 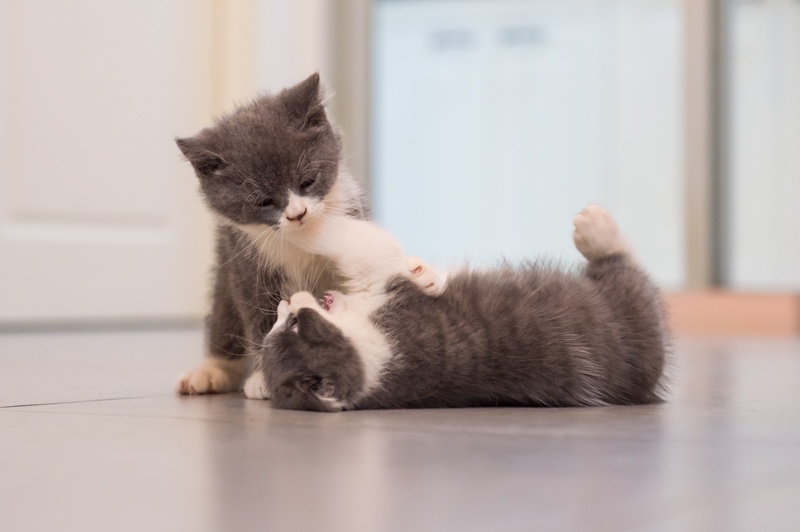 Age can also play a part: younger kittens with lots of energy may want to play too much for an older cat and may not realise when they’re pushing their luck. Cats like to have their own essentials too - sharing is not caring in the feline world. With this in mind, it is important that each cat has its own litter box, food and resting area. After all, you wouldn’t want to share the same plate as your housemate would you? Conflict can happen when a new moggie is introduced too quickly to the other feline residents. But in other cases, tension develops over time after a change occurs which may not be easy to identify. It could be a sudden change such as a cat who pays a visit to the vets and returns smelling different or after a fight with an outdoor cat. Conflict could also occur more gradually, for instance when one of the cats reaches sexual maturity. In any case, cats can be very stubborn and they’re not always all that keen on making up with each other. How can I reduce tension between my four-pawed pals? Firstly, follow the golden rules of cat cohabitation: providing separate spaces and separate food bowls, litter boxes, scratching posts etc. They will be much happier if they have their own ‘dining rooms’ and ‘bathrooms’. They like their privacy. Secondly, use FELIWAY FRIENDS to send ‘harmony messages’ to your cats. Plug the diffuser where your cats spend most of their time. If you have enough space to allow your cats to live in significantly separate areas, consider plugging in several diffusers to make sure each of them gets the message! FELIWAY FRIENDS has been clinically proven to help reduce signs of tension or conflict, even if cats have been fighting for years. Lastly, when tension arises, consider carefully intervening (except if your cats are at risk of injury). However, do not punish them in this situation as this could create fear and reinforce conflict. I want them to be best buddies. What steps should I take? Thanks to the ‘harmony messages’ that FELIWAY FRIENDS releases, you should start to see your furry friends getting along much better within the first 7 days. We recommend using it for at least a month to establish real change. ‘Scent transfer’ is another useful technique in helping them get along by getting used to the smell of each other. Use a soft cloth to rub one cat from face (especially on the cheek) to tail, and then rub the other cat (if no adverse reaction to the scent is noted) to mix their scents. Repeat in the other direction, and then leave a cloth with the combined scent for each cat. 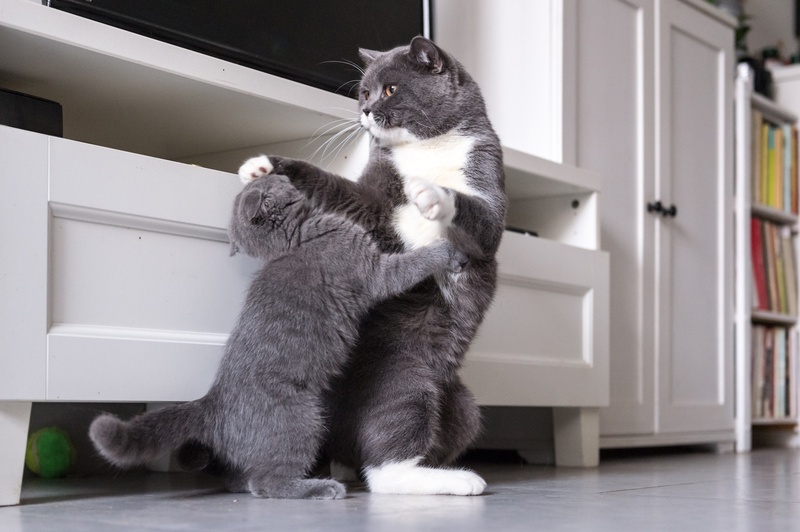 As soon as you can see a decrease in tension between your cats, you might want to create a diversion by offering toys and play sessions to encourage them to interact with each other (under your supervision of course!). You can also offer treats when they are in close proximity to each other and reward them if they stay calm, don’t hiss or growl.